A surprising number of scientists feel that Richard Dawkins does the public understanding of science real harm through his belligerent attacks on religion, which turn off a good half of his potential audience, but no one can doubt that he has a talent for getting science, particularly biology, across to a general readership. This is his first attempt at a children’s book (or rather a ‘family’ book, which is why we're covering it, as it is aimed at a wider readership) and it has much to praise. 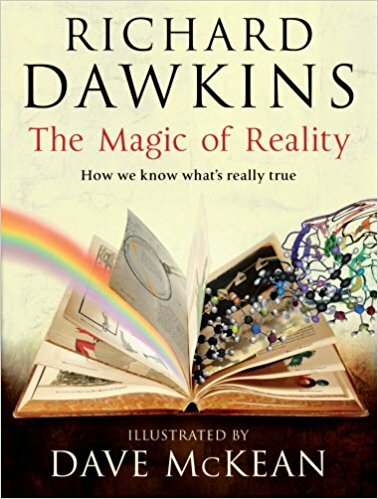 The Magic of Reality is a solid feeling hardback, half way between an ordinary non-fiction book and a coffee table book in format. Every page is illustrated by Dave McKean, with a mix of full colour photographs and diagrams, and heavily stylised line drawings – these last were perhaps a little angular and abstract for the younger audience, but overall the illustration is a good balance of supporting the text without overwhelming the page. 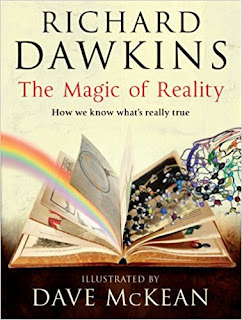 The approach that Dawkins takes is an excellent one, picking up on ten key questions of science – ‘What is reality? Who was the first person? Why are there so many different kinds of animals? What are things made of? Why do we have night and day, winter and summer? What is the sun? What is a rainbow? When and how did everything begin? Are we alone? and What is an Earthquake?’ Each of these starts with ancient mythical explanations (where there are any) then goes on to detail the way that science answers the questions, using the starting point of the basic question to explore many different aspects of science that can be sensibly linked to it. All this works superbly well. Although it seems slightly odd that biology comes before the more fundamental physics and cosmology chapters, the absolute gem of the book (as you might expect) is the way that Dawkins handles ‘Who was the first person?’ His use of a stack of photographs, stretching back into the past, one of each generation, is masterful, inventive and wonderfully eye-opening. I love the way he really pushes the paradox that every creature in every generation is the same species as the previous generation’s photograph – yet over the millions of years we can see a progression from fish-like creature to modern human. If ever there was a single bit of writing that could totally wipe out anyone’s objections to evolution it’s this chapter. I loved it. It will really challenge the readers to think and will open their eyes. However, it’s important not to let the brilliance of much of the book hide a couple of significant flaws. In terms of science content, the huge disappointment is that Dawkins doesn’t mention much modern physics. Both quantum theory and relativity really don’t get any coverage. Particle physics only gets a passing reference with a wimp-out about the author not really understanding quarks. This isn’t good enough. Omitting quantum theory and relativity from physics is like missing evolution out of biology – it’s that significant an omission. The other problem I have is with the final two chapters. Because there aren’t 10 questions, there are 12. The remaining two are ‘Why do bad things happen?’ and ‘What is a miracle.’ The first of these isn’t too bad as it handles chance, but both are primarily Dawkins returning to his bugbear of attacking religion. I don’t think this has a place in a science book, and it certainly shouldn’t be given two chapters. I think this will confuse and quite probably bore younger readers, as after all the other wonders, these two chapters are, frankly, lacking in scientific joy. There is also one very dubious part. Dawkins suggests that readers use a method of assessing miracles that boils down to ‘How do they stand up to common sense?’ The trouble with this approach is much of modern physics doesn’t fit with what common sense predicts. For that matter, most probability runs counter to common sense. As Dawkins himself points out, common sense expects that after a row of throwing heads, a coin is more likely to throw tails – but common sense gets it wrong. It seems highly spurious to use common sense as a scientific tool, when you’ve just shown it fails magnificently. I still think this is a great book, and I suspect many young readers will simply not bother with the last couple of chapters. Covering all of science is tricky, but despite the failings in physics, the rest of the book is good enough to make this, without doubt, an excellent general introduction to science, primarily aimed at younger readers.